A common misconception is that plastic surgery is primarily done for the sake of beauty. In reality, it is a surgical specialty that corrects and restores form and function of different parts of the body affected by trauma, disease or old age. Ophthalmic Plastic and Reconstructive Surgery is a specialized area of surgery that deals with the management of deformities and abnormalities of structures surrounding the eyes. Only ophthalmologists who had specialized training in plastic surgery are best qualified to perform these delicate procedures because they can provide any care that the eye itself may need. Many patients may already have conditions that require surgery by an ophthalmologist but don’t consult because these conditions are not directly related to vision and eyesight. Do you have uncontrolled muscle contractions around the eyes? You might either have Blepharospasm or Hemifacial spasm. Symptoms include difficulty in opening the eyes, rapid fluttering of the eyelids, and may progress to involve the mouth and neck. This is a condition called ptosis. In severe cases, the upper lid completely covers the pupils. Symptoms include difficulty keeping your eyes open and eyebrow arching from the increased effort to raise your eyelids. 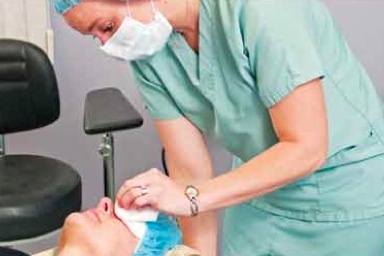 Treatment: Surgery is done to elevate the upper eyelid, permitting full field of vision. Are your eyes watering excessively? Your tear duct might be blocked. When the tear duct is blocked, tears back up and spill over the eyelids. This could lead to mucous discharge, eye irritation, and painful swelling. Treatment: For some cases, especially among babies, a fine metal probe can be inserted down the duct to open the obstruction. In severe cases, especially among adults, a new opening must be surgically made to bypass the obstruction.What other conditions should you be worried about? Essentially, any condition in the area around the eyes that you feel is out of the ordinary needs the immediate checkup of an ophthalmologist. Thickening of the eyelid or eyelashes appearing distorted could be indications of skin cancer. An experienced eye care specialist should be able to give you a proper diagnosis and the best treatment possible. Some eye doctors check your grade and prescribe glasses. They are called optometrists. Eye doctors who prescribe medicines and operate on the eye are called ophthalmologists. The ophthalmologists at ACES Eye Referral Clinics are experienced subspecialists working together as a team. Subspecialists are eye doctors who undergo further subspecialty training in specific fields like Retina, Glaucoma, Pediatrics, Refractive Surgery, Plastic Surgery and Orbit. The ACES TEAM approach gives patients the benefit and convenience of a second or more expert opinions in one visit. ACES Eye Referral Clinics in Cebu and Dumaguete employ a team approach to eye care, ensuring you of the most informed and trusted diagnostics in Ophthalmic Plastic and Reconstructive Surgery. So if you feel you have a condition that needs the immediate care of experts, go to ACES. The ACES team will make sure you get the total, long-term eye care you deserve. Dr. Ronald Rellosa Medalle is an ocuplastic and reconstructive specialist and also a member of the ACES CATARACT SERVICE. He took up an Ophthalmology Basic course in Stanford University then proceeded to an Oculoplastic Surgery Fellowship at the St. Francis Medical Center in Honolulu, Hawaii.